Renewable energy made up just over 41% of Germany’s power supply last month, the most ever at around 19.5 TWh. It’s a good thing, too, because nuclear power production may have fallen to its lowest monthly level since the 1970s – even though no nuclear plant has been switched off since 2015. Meanwhile, has France’s tentative nuclear reduction reached a milestone? Craig Morris takes a look. In March, Germany posted yet another wind power record, with production peaking at 38.5 GW on March 18, just topping the old record of 38 GW on February 22. The month as a whole was the biggest ever for renewables in the country as well, thanks primarily to more electricity from wind and solar. Together, they generated some 12.5 TWh, though it was not a record month for either. (The monthly record for wind is 11.2 TWh from December 2015; for solar, 5.5 TWh from July 2015.) Power from biomass (not wood pellets!) was also strong at 4.5 TWh but also far from its record of 4.8 TWh in December 2014. Likewise, hydropower was some 50% stronger than in recent months, but otherwise unremarkable. Neckarwestheim II, the youngest reactor in Germany, went off on Friday night for scheduled refueling, but with a twist: the fuel rods are not simply to be changed. Rather, the operator, EnBW (now wholly owned by the government of the state of Baden-Württemberg, which has a Green Minister-President) wants to inspect each fuel rod and only swap out the ones that need it (report in German). The firm must close the reactor at the end of 2022, so it is working now to ensure that the fuel rods left over then are as spent as possible. Grohnde, another reactor undergoing its regular overhaul, is expected to come online this week after more than a month. Brokdorf remains offline after rust was unexpectedly discovered on its fuel rods at the beginning of February. It is still unclear when the reactor will go back online. Its fate also partly lies with the Greens in the state government of Schleswig-Holstein. Finally, Philippsburg II has been off since December, when an emergency system failed. There is also no date for its ramp-up. This summer, the next reactor is scheduled to be shut down for good: Gundremmingen B, a plant that is currently running full blast. Under the original phaseout plan from 2002, the reactor would have closed in 2016. It most recently made headlines for being infected with the Conficker computer worm. 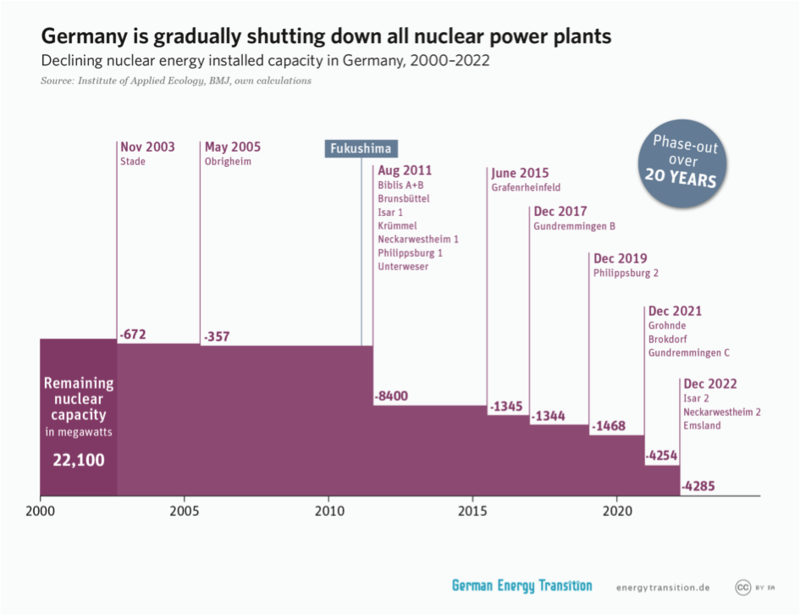 The last German reactor was switched off almost two years ago. Across the Rhine, France’s Bugey 5 reactor’s containment vessel is now to be held together with whitewash (lait du chaux) and resin (mastic), as a press release (in French) from French nuclear watchdog ASN explains. The resulting lime mortar is now undergoing tests to see if it does indeed patch up the leaky parts at the bottom of the containment vessel. Bugey 5 has been offline since August 2015. The French hope to get another three reactors online this summer. At Fessenheim 2, the oldest in the country, excessively high carbon concentrations were found. Gravelines 5 needs a new generator, as does Paluel 2 – except that there, the old generator crashed inside the reactor as it was being removed, so a few other things are needed now as well. In similar news, Fessenheim’s closure has become official with its publication in the Gazette on Sunday. The plant will close whenever the new reactor at Flamanville goes into operation. It is unclear what happen if the EPR reactor turns out to be impossible to finish. France aims to reduce its reliance on nuclear power from 75% of demand to 50% by 2025.